Many years ago, in Perugia, I had a literature teacher, Mrs. Finocchi, who used to bark about cappuccino in every class: “The only cappuccino I drink in this town is from Sandri Bar. They are decent enough to use fresh milk. In Rome they don’t dare prepare a cappuccino with milk from a carton.” She had to make a point: she was from the big city, la capitale. Perugia, an Etruscan and Medieval gem, home of two universities and 165,000 people, was a mere backwater in her view. Mrs. Finocchi was a small lady in her 60’s, wearing thick squared glasses, no make up or high heels, and dark wool suits. She didn’t bother dying her hair and her voice contradicted her appreciation for coffee, as her classes were as sleepy as lullabies. I can’t remember any of her lectures about Dante or Bocaccio, but she instilled in me a lifelong interest in the not quite literary subject of cappuccino research. Even before I graduated and left Italy – a departure against my deepest wishes – I started to take notes after my daily doses of cappuccino. In Perugia, we had a handful of bars besides the Sandri, where milk might not come straight from a farm, but where froth was dense, consistency was creamy, coffee beans were pure, and the first sip was like sitting by the fire on a snowy day. Some of these bars, like the Morlacchi or the Turreno, still exist and you won’t be disappointed if you go there in the morning and order yourself a cup. It’s best if you pair it with a cornetto alla crema or a cornetto alla marmelata – the Italian version of the French croissant, filled with custard cream or jam. They are always fresh in this country where lunch – not breakfast – is the main meal of the day. My obsession for the perfect cappuccino took a new dimension once I moved back to Brazil. Even living in São Paulo, the most diverse city in the country, with a large Italian descendent population, all I found was coffee with low fat milk covered with a sad layer of froth. By the time you are on the second sip the foam disappears and all you have is a boring, watery drink with no art applied to it. Years later I moved to New York. My search continued. Nowadays I mostly go to two places for a perfect cup of cappuccio (as Italians sometimes refer to it): St.Ambroeus and Via Quadronno. Forget Little Italy and Arthur Avenue, the traditional Italian zones: instead of debating about fresh or carton milk, most places will present you with milk frothed with no attention, spilling out of a mug much bigger than it should be. A cappuccino is not a meal, just a pleasant break. 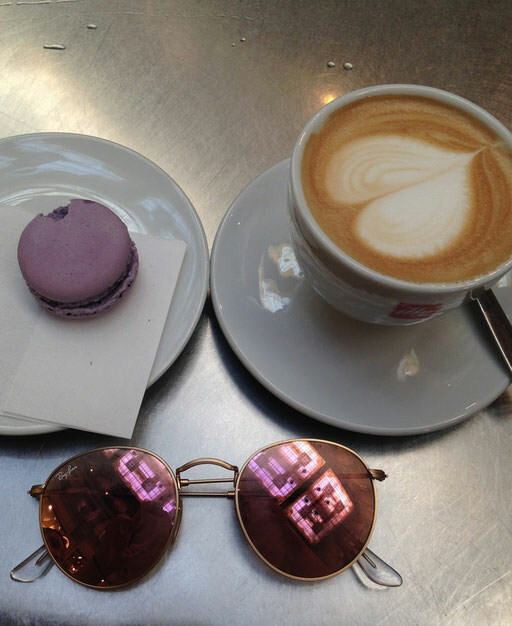 Last summer I went back to Rome and, once in town, I walked straight to one of my favorite cappuccino places in the city, the Saint’Eustacchio, close to the Italian Senate. Their perfect creamy small cups are still the same. The bar, opened in 1938, is elegant but unpretentious, and serves now a great deal of tourists, who eagerly buy lots of souvenir cups, and also their packed coffee in bright yellow bags. Sant’Eustacchio is famous for its secret mixture of coffee beans. Most of the locals don’t sit at the tables outside to enjoy their cappuccio. They stand up at the bar, chat with the owners and go away in a hurry. I found out why: if you drink your coffee at the bar it still costs the Italian price: a little less than 2 Euros. If you sit at the tables outside, you pay 7 Euros and fifty cents, and you have to share a lot with people who come every second to ask for money. It’s too much for fresh milk.